A happy thing just happened in my Dividend Growth Portfolio (DGP). Incoming dividends, building up as cash, went above $1000. The cash stash has been growing since my last stock purchase in May. Passing the $1000 threshold means that I get to go shopping for my next dividend reinvestment. Under the rules for this portfolio, I never add new outside money. So I can only go shopping when dividends accumulate past the trigger amount. I love to go shopping. But…what to buy? I decided to compare the two candidates using the Quality Snapshots that I’ve been developing over the past few months. Here’s the scoring system. A perfect score would be 20, if a stock got 5 point in each of the 4 categories. Here’s how the two candidates stack up. As you can see, Texas Instruments has a big quality edge over Enterprise Products Partners. All its categories are green. Its total score is just one point short of a perfect 20. I also compared the companies’ dividend resumes. To do so, I created a scoring system based on the approach described in Dividend Growth Investing Lesson 14. 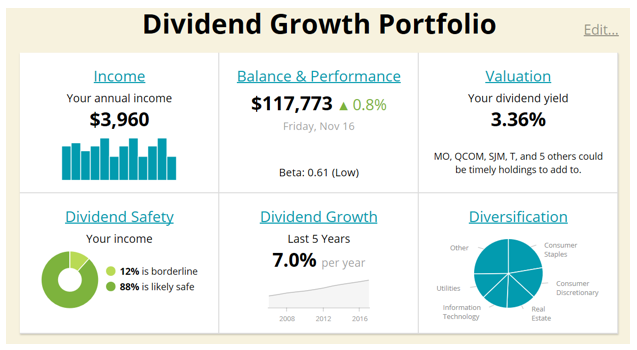 Note that “SSD” refers to Simply Safe Dividends’ dividend safety score. The asterisks are explained beneath the table. These scores are closer, because Enterprise Products Partners has such a high yield at 6.5%, more than double Texas Instruments’ 3.1%. On the other hand, TXN has had a much faster dividend growth rate, and it also gets a little higher safety score from SSD. My decision is to buy Texas Instruments (TXN), even though, with its lower yield, it will send me fewer dollars per year, at least at the beginning. Its faster dividend growth rate will help it catch up down the road. The main driver of the decision is TXN’s extraordinary quality as a company. I have been aiming to raise the overall quality of my portfolio for the past couple of years, and TXN will help me continue down that path. This order summary from E-Trade shows the purchase on November 19. I got 10 shares of TXN at $97.50 per share. The total cost of the purchase was $981 including commission. The cash in the portfolio dropped back to $26 after the transaction. That starts the next kitty. I will accumulate dividends back up to $1000 for my next reinvestment, which should occur in about 3 months (February-March, 2019). Texas Instruments becomes a new position in the DGP, raising the portfolio’s holdings to 24 stocks. The following images are from Simply Safe Dividends’ Portfolio Analyzer, which I use to keep track of several metrics pertaining to the portfolio. Here was the Analyzer’s dashboard before the purchase. Note the annual portfolio income of $3960 in the upper left. The addition of Texas Instruments increases the portfolio’s annual income by $31 to $3991. Here’s how that will happen. Texas Instruments is paying $0.77 per share per quarter, or $3.08 per share per year. Multiply by the 10 shares I bought, and you get $30.80 more in dividends flowing into the portfolio in a year. $31 per year sounds small, but it’s a 0.8% increase in annual income. Four purchases like that in a year would add more than 3% to the portfolio’s income, even if none of the stocks in the portfolio raised their dividends at all. The total value of the portfolio remains unchanged, less the $6 commission. What happened is that I converted a cash asset into a stock asset. The current yield of the DGP stayed the same at about 3.4%. Dividend safety of the whole portfolio stayed the same (very safe overall). The dividend growth rate of the portfolio went up a hair, because TXN has been a very fast DG stock. Yield on cost (YOC) is not shown on the dashboard, but it’s easy to calculate manually. YOC goes up each time new shares are added to the portfolio and each time a stock raises its dividend. A year ago, at the end of November, 2017, the portfolio’s yield on cost was 8.1%. It has increased to 0.4 percentage points since then. Yield on cost shows what yield you are receiving per year based on your original investment. So this portfolio is now generating 8.5% of its original cost per year in cash dividends. This purchase is an example of the impact of reinvesting dividends. The $31 per year in additional income is new money flowing into the portfolio that wasn’t there before the purchase. The cash was generating nothing. Now that it’s been converted to stock, it becomes an asset that pays me money. Also not that the money for the purchase came from within the portfolio itself… from the dividends of other companies. I did not need to add new outside money to the portfolio to make this purchase. The purchase also illustrates compounding (see Dividend Growth Investing Lesson 5: The Power of Reinvesting Dividends). Compounding means making money on money already made. The money already made was the $1000 accumulated in dividends since the last reinvestment. The new money made is the increase in the dividend stream, not to mention capital gains that may also come from owning these shares. As always, do not take what I do as a recommendation for yourself. Always conduct your own due diligence before buying anything. Specifically, nothing in this article should be taken as a recommendation about Texas Instruments or its suitability for any particular portfolio. My goal in this article is to explain what I did, why I did it, and how it advances my investment objectives.